A lotus birth is also referred to as “umbilical non-severance”, meaning the umbilical cord is left intact and the newborn continuous to be attached to the placenta after birth until the umbilical cord gets separated after several days. The cord and placenta are left attached and preserved to be kept within close proximity to the newly born infant. Lotus birth entails waiting for several days (3 to 10 days after birth) until the cord naturally detaches from the baby. The umbilical cord is left intact after delivery. After the placenta comes out, it is placed in a bowl just close to the mother and baby. The placenta is then gently washed using warm water and then dried with a cloth. Excess fluid is drained when necessary. The placenta is then wrapped in an absorbent material and should be changed daily. Preservatives like salt may also be used. The wrapped placenta must be positioned in a way that would allow plenty of air circulation. Minimal movement is advised while the cord has not fallen off. Why Do Some Parents Prefer To Have A Lotus Birth? Advocates of lotus birth believe that the natural process of delivery shouldn’t be disturbed by modern cultural standards. It connotes a certain aspect of the spiritual connection between the newborn and the placenta. They believe that the placenta is a special part of pregnancy as it has the same biological origin as the baby. It may promote a longer period for paternal, maternal and child bonding. It may allow more placental blood (around 40-60 ml) to be transfused to the baby. It provides more time for rest for both the mother and the baby. It promotes early skin to skin contact. It may keep the baby “unhurt” because the cord wasn’t cut. The placenta is believed to help the immature liver of the newborn in the detoxification process even outside of the womb. 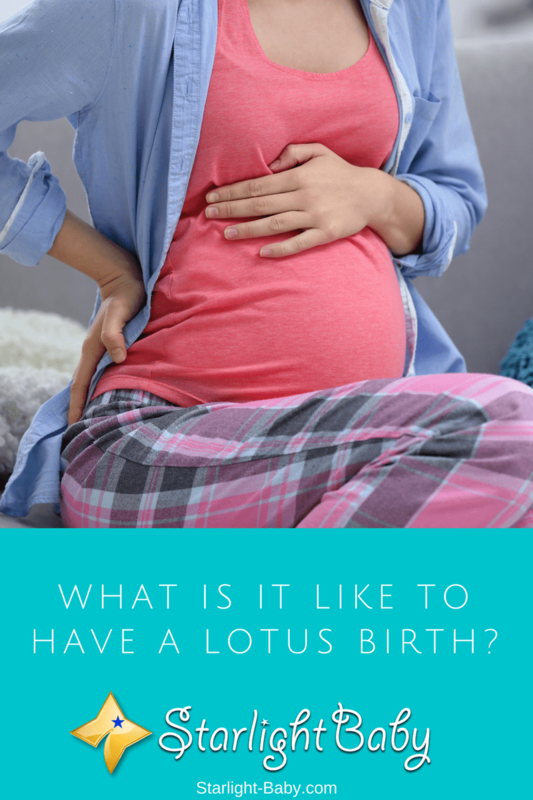 How Does The Medical Community Perceive Lotus Birth? Medical practitioners generally discourage its practice due to hygiene and sanitary reasons. According to medical points of view, the placenta is beneficial for the baby when inside the mother’s womb because it is the primary connection of the fetus to the mother. During this time, it assists in the delivery of essential nourishment to the fetus. However, upon delivery, the placenta is viewed as a dead organ which may promote bacterial growth and may become a source of infection for the baby. Recent studies recognize the benefits of the placental blood, and this is the reason why the clamping and cutting of cord were prolonged for around 30-60 seconds or until the cord stops pulsating. After that, the placenta must be disposed properly and the umbilical stump (the part that was kept attached to the baby) should be cleaned and sanitized until such period that it dries up and automatically fall off from the baby’s navel. It is of a parent’s personal discretion whether they would like to engage in the practice of lotus birthing or not. Certain cultural, spiritual and medical benefits and risks should be weighed before making the decision to partake in the practice. In the end, the health and safety of the newborn baby must be considered and prioritized.